See libraries with cake pans (and other Library of Things) on our scatter map! With Valentine’s Day coming, libraries are setting up thematic displays. Making your display truly eye catching isn’t that hard: in fact, it’s a bit of a cake walk! 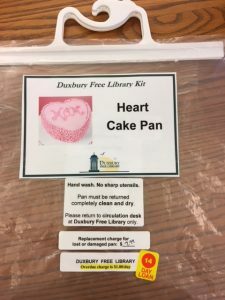 Read below for advice from other Massachusetts libraries that have frosted a sense of community by adding heart shaped cake pans to their collection. Although your library would have to move at bakeneck speed to add heart shaped pans by Valentine’s Day, this is a good opportunity to consider preparing for other holidays and events. Many libraries start their Library of Things collection with ukuleles, but in addition to being able to lend a cake-ophony of noise, many cross cake pans off their bake-it list next. Some libraries carry other exciting cookware, but the main ovent is cake pans. Aside from holiday related shapes, cakes in the shapes of trucks, or with numbers on them for a specific age, are extremely popular with parents. You can also try posting a survey to ask your patrons for some Angel food for thought on their preferences. Regardless of what theme, all librarians reported great interest from patrons, with even seasonal pans going out year round. A flour for the dramatic may help, as Norwood says their social media cooking collection displays get a high response. 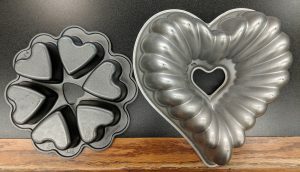 However, you don’t have to bundt over backward to have a great cake pan collection: once you add a few to your collection, you’re likely to receive donations, especially of elaborate pans for a specific year birthday. Librarians were concerned about starting a collection of cooking items that they may be returned dirty, but found patrons tend to be very conscientious about cleaning them thoroughly. However, it’s batter safe than sorry, so they still recommend reminding patrons verbally and with a label that they should be cleaned and dry before being returned, which can be reinforced with a fine. Despite some patrons being grossed out by the idea of using communal cookware, the cake pans circulate a lot, particularly holiday or event themed, such as baby showers, and patrons who use them are thrilled. Shelf space may be an issue. If no other ideas spring(pan) to mind, you can create a binder for patrons to look through and store your pans all together in large tupperwares: several libraries have found that solution works nicely. As with every Library of Things theme, patrons will get confused by whether it’s restricted to in-town residents or anyone in network, so make sure to clearly label them both on the item and in your catalog if there are any restrictions, or people will show up from all over looking to borrow them! 1. How will you store them? 2. How will you clean them, if/when they’re returned not thoroughly cleaned. 3. Will you provide decorating instructions? However you decide to package them and no matter how many you’re able to offer, if you lend cake pans, your patrons are sure to be grate-ful! Have a question about library cake pans? Do you circulate cake pans in your Library of Things and have advice for other librarians? Please comment on this post below! Do you have an unusual collection? Want to be featured on our LibGuide? Contact Laura Bogart. Article by Laura M. Bogart, with contributions by Robin Brzozowski of Athol Public Library, Colin Wilkins of the Public Library of Brookline, Nancy Delvecchio of Hudson Public Library and Carla Howard, Kate Tigue, and Lydia Sampson, from Morrill Memorial Library, Norwood. This entry was posted in Library of Things and tagged cake pans, valentine's day by laura. Bookmark the permalink. Great post! 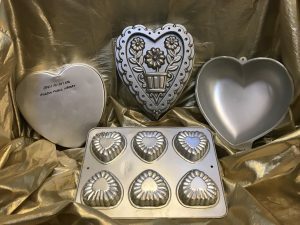 We also find that religious cake pans are popular- for example, a cross shape which people may use for a First Communion or Confirmation but do not need to own permanently.